SHOW ME YOUR MAH JONGG SETS! 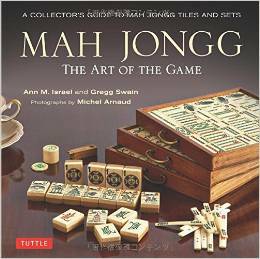 Alyce G sent me a photo and information about the cherished set she and her Mah Jongg group use for their game play. How wonderful to play our favorite game with a set that was a special gift! And I love that Alyce and 3 or 4 people from her Mah Jongg group go on a Mah Jongg cruise every year. What a great thing to do! 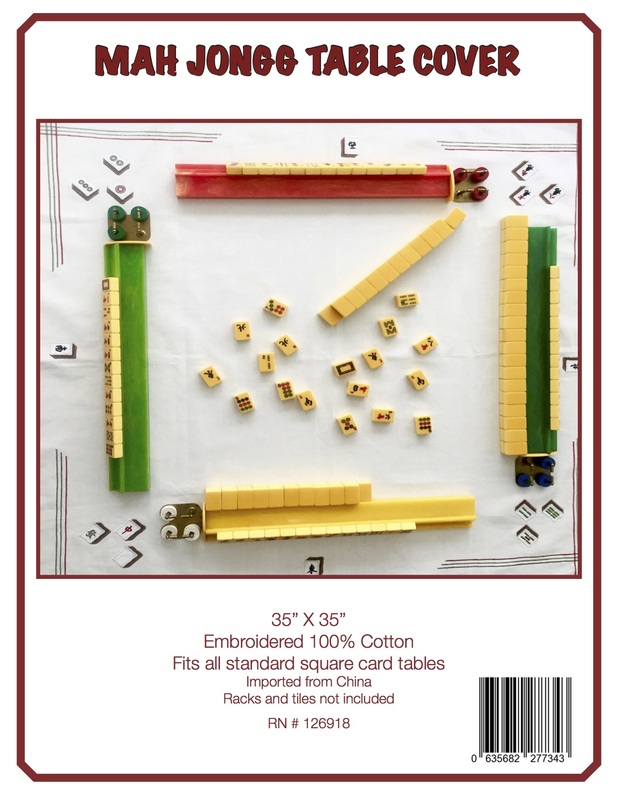 If you have Mah Jongg sets with a special history or memory, please send me photos and the story behind your set – I would love to post these cherished memories! 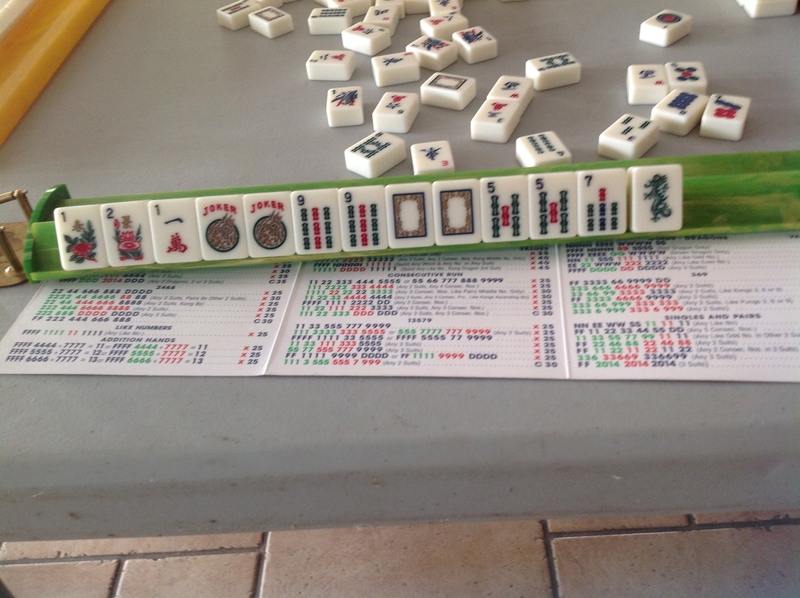 This entry was posted in Mah Jongg and Me and tagged Carnival, mah jongg, Royal on October 6, 2014 by Mah Jongg and Me. Alyce, your tiles, remind me exactly of my set that I received as a gift in the early 1970s. The tiles are in a case marked: Imported by IMPCO Sales, 127 Portland St., Toronto. My set only contains two jokers and two blanks, which we use as Jokers. I have tried to find a match to my tiles, unfortunately with no luck. They certainly are beautiful tiles Alyce! I found replacement tiles for an antique bone & bamboo set. Loretta L: If you read this, can you remember who we used to replace tiles? I agree that Where the Winds Blow is terrific, and I’m glad to hear that Lynne is continuing that tradition of excellent customer service that Faye gave us. Best of luck to Lynne in her new business! On Alyce’s tile search: IMO she should check two sites: mahjongtiles.com, where Matt has lots of orphan tiles posted with sizes & at reasonable prices. Great customer service. I’ve been able to rescue several vintage sets because he has had the replacement tiles I need. Alyce also should consider sending a tile to Carol Ann at Charli.org. She is more expensive, but she will search through thousands of orphan tiles to try to find the best match. Guaranteed matching tiles are out there somewhere! Thank you, Tracy! I highly recommend Johni Levene who has a huge orphanage, restores sets, and offers very fair prices. Johni can be reached at Lajohni@aol.com.